There’s a tracker setup Tag, a little Konami code surprise, as well as some code to measure the SERP bounce time on my site. Each one of them has some dataLayer.push() methods executed, and the tracker setup does load the analytics.js library, so it’s not like it’s lightweight stuff. But still, 2.5 seconds? That’s a lifetime in Internet time! Anyway, this measurement has been quite eye-opening. It’s a good idea to be aware of what happens behind the scenes. Even asynchronous operations can be harmful to page performance, especially if there are many of them running one after the another. The reason for this is that the load event for the window object is delayed until the page and all its related resources (e.g. scripts and images) have completely loaded. This might lead to problems with frameworks like React, where many operations are executed only after the window.onload event has been dispatched in the browser. Let me quickly walk you through how I setup this measurement. It’s not a walk in the park, and if you want to try it yourself I urge you to test it in a staging environment first! To make it work, we need to hack the Data Layer. That’s right, we need to do what Google Tag Manager has already done and hijack the dataLayer.push method to overwrite it with our own. When a dataLayer.push() happens, this code is first executed. So my little hack is automatically measuring the time any 'event' takes to complete, as long as it happens before the page has loaded (as that’s the only performance I’m interested in). By the way, you don’t really need to add the eventStartTime into the object, as you already have a locally scoped variable t which stores the start time in a closure. However, I prefer to keep it there in case I want to do further debugging, since with the start time I can also build a waterfall model out of the performance times, to see how much execution of these different pre-load events overlap. NOTE!! 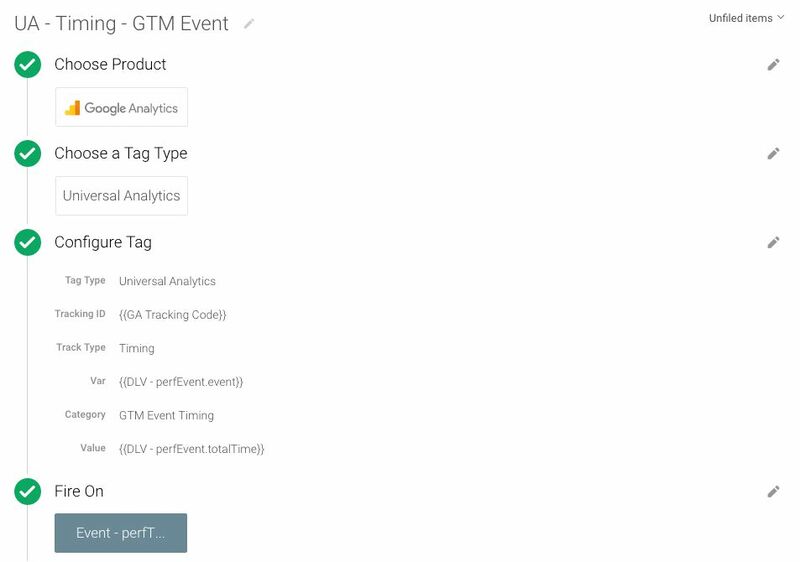 The script automatically excludes gtm.linkClick, gtm.timer and gtm.formSubmit, as these have their own uses for eventCallback (the Wait for Tags option). Similarly, if you’re already using eventCallback with some events, be sure to add them to the Array of excluded events, or you might break your site! Remember to test first, please! And this Tag will send your hits as User Timings, after which you’ll find the report in Google Analytics, under Behavior -> Site Speed -> User Timings. I’ve given User Timings a thrashing before, since they’re really useless for timing ALL the hits on the site. But if you’re fine with just a sample, such as in this case, they work really well. Remember kids, good performance is good. Bad performance can kill… your site’s user experience, and other stuff, too!